The Aura Ozone Monitoring Instrument (OMI) Level-1B (L1B) Geo-located Earth View UV Radiance, Global-Mode (OML1BRUG) Version-3 product contains geo-located Earth view spectral radiances from the UV detectors in the wavelength range of 264 to 383 nm conducted in the global measurement mode. In the standard global measurement mode, OMI observes 60 ground pixels (13 km x 24 km at nadir) across the swath for each of the 557 channels of UV2 (307-383 nm) and 30 ground pixels (13 km x 48 km at nadir) for the 159 channels of UV1 (264-311 nm). Each file contains data from the day lit portion of an orbit (~53 minutes) and is roughly 180 MB in size. There are approximately 14 orbits per day. 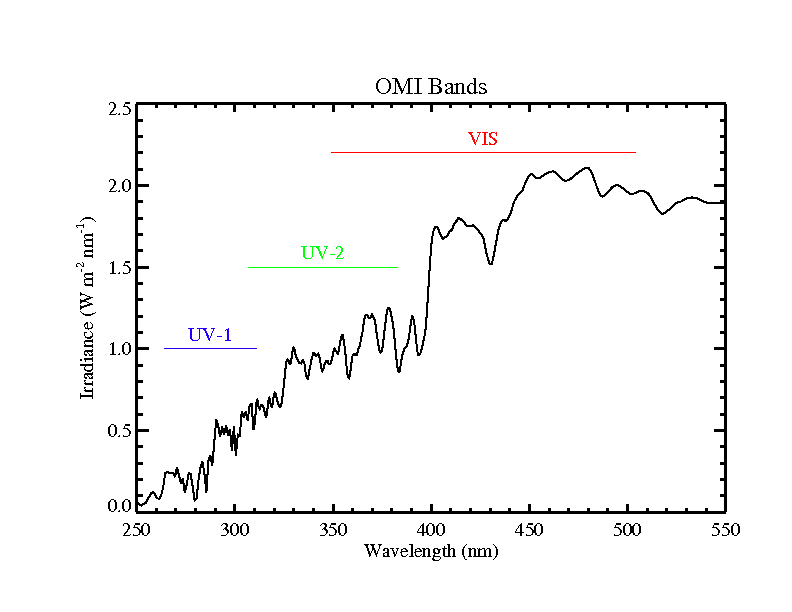 Once a month, in one orbit, OMI performs dark measurements, it does not perform radiance measurements. In addition, OMI performs spatial zoom measurements one day per month. For that day, this product also contains UV2 measurements that are rebinned from the spatial zoom-in measurements. In original spatial zoom mode the nadir ground pixel size is 13 x 12 km and measurements are available only for the UV2 and VIS wavelengths (306 to 432 nm). The shortname for this OMI Level-1B Product is OML1BRUG. The lead algorithm scientist for this product is Dr. Marcel Dobber from the Royal Netherlands Meteorological Institude (KNMI). The OML1BRUG files are stored in the HDF4 based EOS Hierarchical Data Format (HDF-EOS). The radiances for the earth measurements (also referred as signal) and its precision are stored as a 16 bit mantissa and an 8-bit exponent. The signal can be computed using the equation: signal = mantissa x 10^exponent. For the precision, the same exponent is used as for the signal. Marcel Dobber. 2007-09-20. OML1BRUG. Version 003. OMI/Aura Level 1B UV Global Geolocated Earthshine Radiances 1-orbit L2 Swath 13x24 km V003. Greenbelt, MD, USA. Archived by National Aeronautics and Space Administration, U.S. Government, Goddard Earth Sciences Data and Information Services Center (GES DISC). https://doi.org/10.5067/Aura/OMI/DATA1002. https://disc.gsfc.nasa.gov/datacollection/OML1BRUG_003.html. Digital Science Data.